At some point, a company can decide termination of contract with an employee or a group of employees. The reasons behind termination can be several. A company may not be running profitably of late, and that causes deciding termination of non performing employees so that inflation can be managed. A company may also find disciplinary issues with employees, and thus it terminates contract with them. 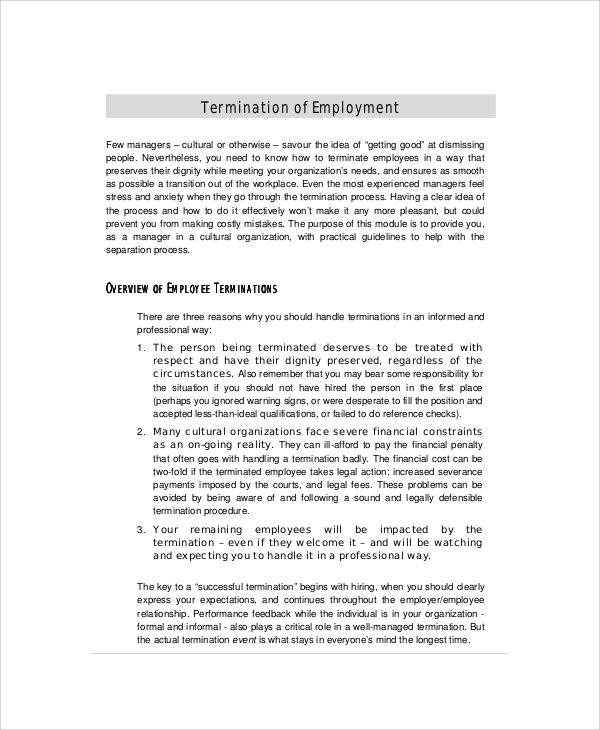 The formal process of termination is writing a Termination Letter or dismissal letter to the employee. Before terminating a contract with an employee, it is a professional etiquette to serve a letter of termination to that particular employee. 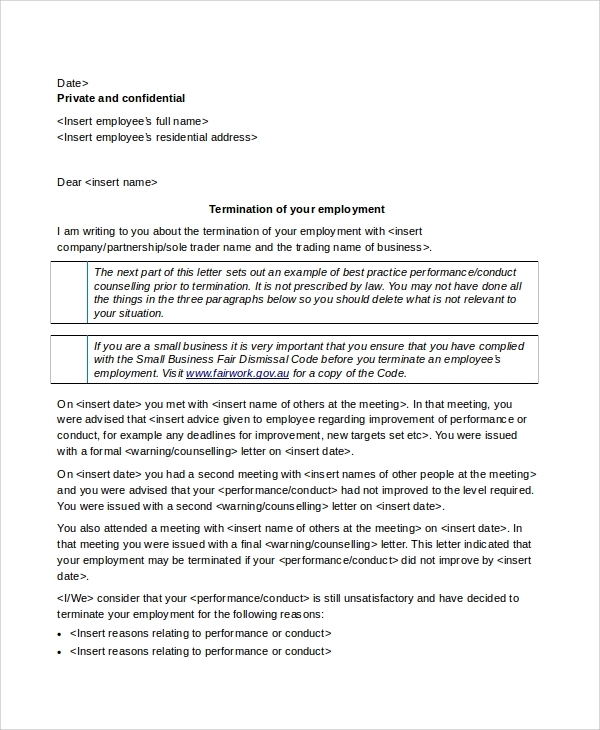 To craft a professional employee contract termination letter, you can use this template. Employee termination recommendation letter is typically written by HR managers, senior executives or project managers to the employer or team of directors of a company. To craft such letters with ease, you can use this template. The basic purpose of using termination letter is to notify an employee on contract termination that has been decided by the employer. Termination can be the aftermath of several reasons. Ideally, a termination letter is considered to be valid and professional, when it discloses strong reasons for contract termination. Violation of organization disciplines by employee or financial crunch of employer is the common reason for employee contract termination. Who Needs Employee Termination Letter Samples? Employee termination letter sample is required by the employers. 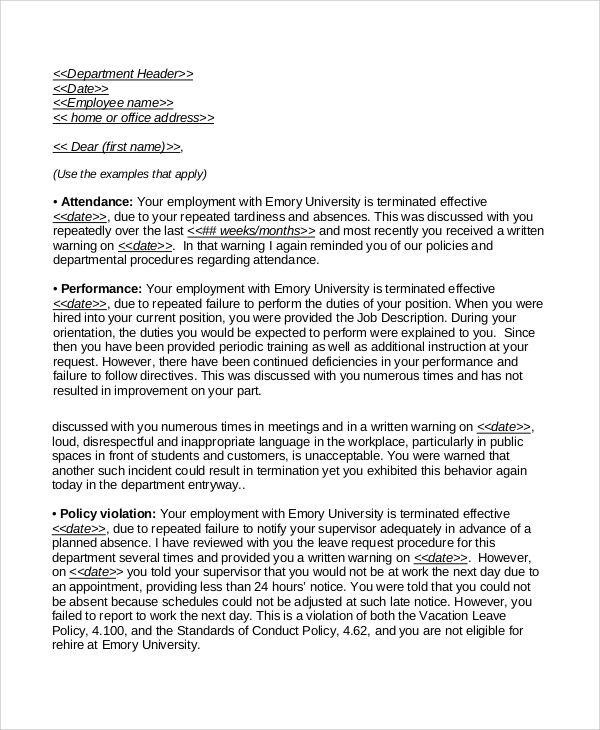 For small size businesses, employers write this type of letter for the employees who are identified to be terminated from job contact due to certain reasons. 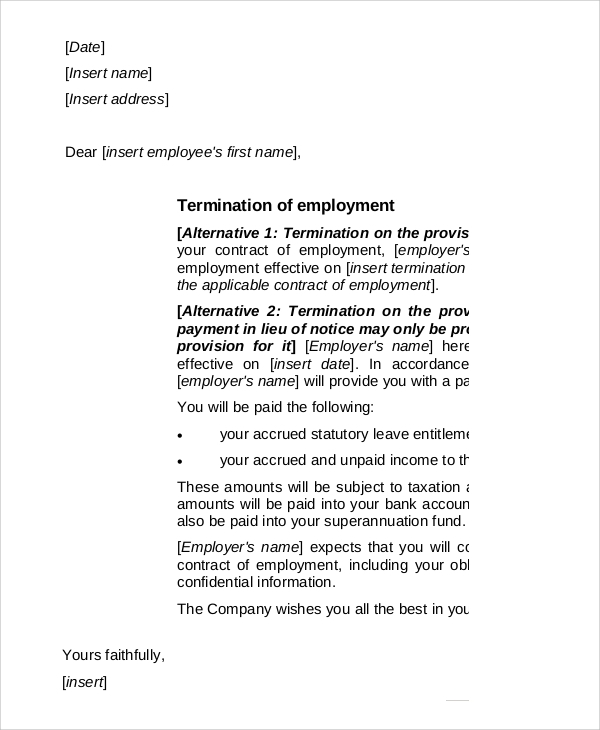 In large companies, termination letters are generally written by HR managers. It could be an issue of nonperformance or violation of organizational rules repeatedly or for creating damage to the organization. It could be financial damage or reputation damage. Generally, no company would like to continue a contract with employees who are found to be guilty of harming the company’s interest. Apart from these, senior managers or team leaders can also write such letters. 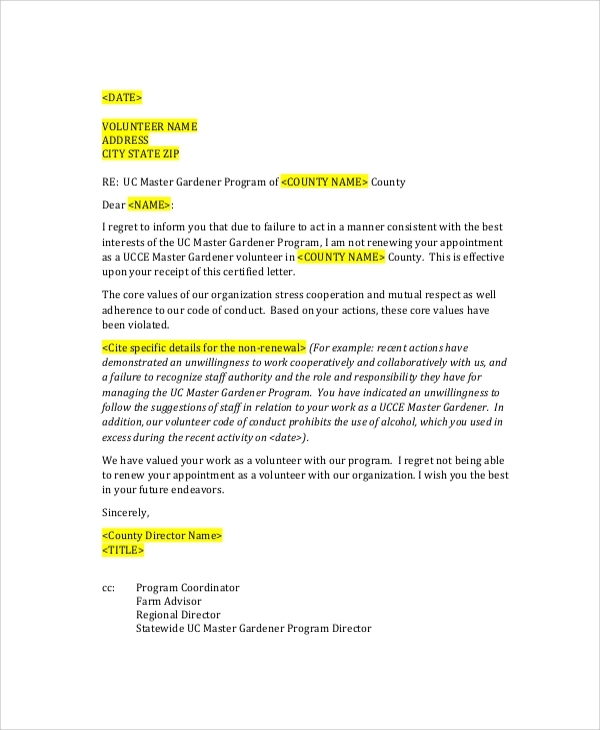 How to Create Contract Termination Letters? Creating employee contract termination letters is not a difficult task. Employers or HR managers need to know some basics of writing such letters though. The first and foremost thing is maintain professional format. The second important thing is maintaining professional tone throughout the write up. 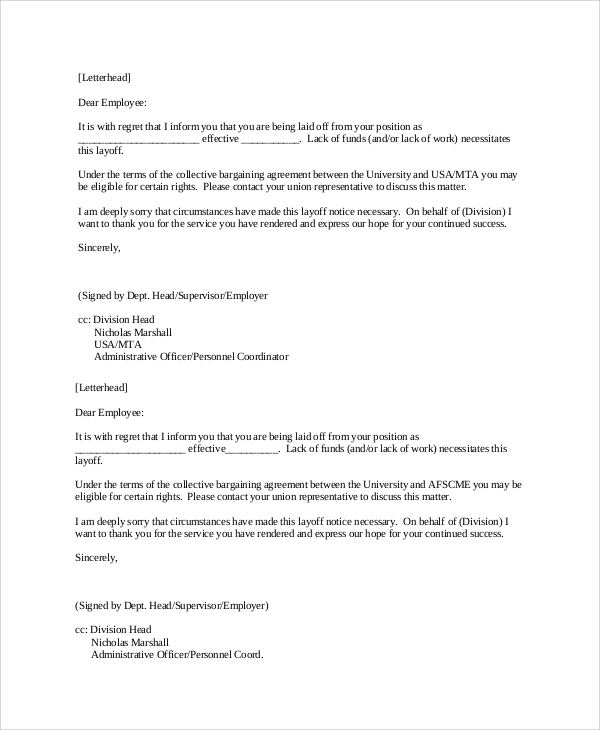 The letter must disclose the reasons for contract termination truthfully. This type of letter has to be furnished before terminating the contract. Furnishing no letters for dismissing contract can be considered as unlawful or unethical. To write a Sample Termination Letter , we offer the easiest way for finding some online templates. Using online templates helps to complete the job with accuracy and within the quickest possible time. Writing employee contract termination letter or dismissal letter is not an easy thing. It should be written professionally and the format has to be followed with accuracy. To craft such letters with perfection, you can opt for the dismissal letter sample. Using samples is the easiest way of creating such letters.